As the economy inevitably changes, so too does the City of Richmond. Located at sea level, Richmond’s flat terrain, rich in alluvial farmland, was once an agricultural hub. These days Richmond is a combination of industrial developments and residential and commercial properties. So, it’s no surprise that Richmond Pressure Washing is our most common service requested. The benefits of making use of our Richmond Pressure Washing Service at your property, and its surrounding area, are numerous. 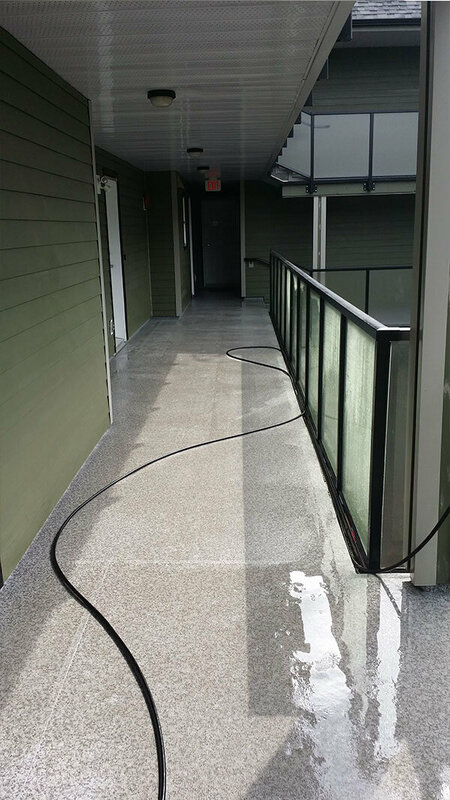 Pressure washing is one of the most common and effective applications for cleaning exterior surfaces such as vinyl, stucco, wood or concrete. Patios, railings, retaining walls, walkways, paving stones, driveways, tennis courts, pool decks, parkades and outside furniture are all exposed to the elements year round. Our wonderfully diverse B.C. winter weather can cause issues such as black discolouration, moss and green algae growth. These not only look unpleasant but, left untouched, can cause permanent damage. Our Gorillas aim to make old look new again with our “completely clean” system. Starting with a combination of our “Gorilla Foaming Agent” (looks like shaving foam! ), and degreasers. Following that; “Gorilla brushes” backed up with some good old-fashioned elbow grease. Then pressure washing (of course) with our seamless wand system. This guarantees the best possible result. Whether you want to maintain and prolong a new paint job, prepare a surface for refinishing, or treat your home or business to a little TLC, Gorilla Property Services can help.